Just before christmas in 2009, the KDE community released the second beta of the upcoming KDE 4.4 desktop environment (or to use the correct name, KDE Software Compilation 4.4). In Slackware Linux’s development tree we still have 4.3.4 which works really well, but in KDE 4.4 some major strides are being made towards an even better work environment. I decided to have a look at these new developments, especially since the Nepomuk search should work a lot better with the new and fast Virtuoso backend, and built the whole of KDE 4.4.beta2 for our 64-bit Slackware Linux. I was not disappointed. Even though this KDE 4.4 prerelease is labeled “beta”, I have found it to be quite stable, fast, slick and very useable. The improvements which I have seen from 4.1 -> 4.2 -> 4.3 -> 4.4 keep amazing me… let alone the giant leap that lay between 4.0 and 4.0… everybody remembers the heated debates between the early adopters of KDE4 and those who hated it. At the time we added KDE4 to Slackware, that was seen as a milestone release. Now, I can not imagine ever going back to using KDE3 as my default desktop. And yes, Nepomuk search is pretty nifty, lightning fast and it does not feel like it is eating away my computer’s resources. You will need to run a development snapshot of 64-bit Slackware (meaning, slackware64-current of around 25-december-2009 or newer). These packages do not work on the 64-bit release of Slackware 13.0. Neither do I have packages for the 32-bit release of slackware-current, simply because I do not have a computer in the house which is running slackware-current and is powerful enough to build KDE4 and the various dependencies in a reasonable time. KDE 4.4 has requirements that are a bit different than with KDE 4.3.x which we have in slackware-current, or even 4.2.4 which we have in Slackware 13.0. You will have to upgrade several non-KDE Slackware packages as well as add some new ones. Now, go and have a look at http://alien.slackbook.org/ktown/4.3.85/ . Version 4.3.85 is the same as 4.4.beta2. All of the dependencies that you need are in the “x86_64/deps” directory. All KDE packages can be found in “x86_64/kde”. KDE localizations (language packs) are available in “x86_64/kdei”. These are the steps you take to upgrade slackware64-current to KDE 4.4.beta2. It will bring you KDE4 even if you did not have it installed before. As part of the steps you will be downloading the new Slackware packages, but not the source or SlackBuilds. It is easy to modify the download command to also get you the sources if you want this. # lftp -c "open http://alien.slackbook.org/ktown/4.3.85/ ; mirror x86_64"
Of course, you should not run those commands while running X and certainly not while running KDE… After the upgrade process finishes, you can start a KDE session and you will be greeted by the familiar yet subtly different user interface of KDE4. ca, da, es, et, it, sr. 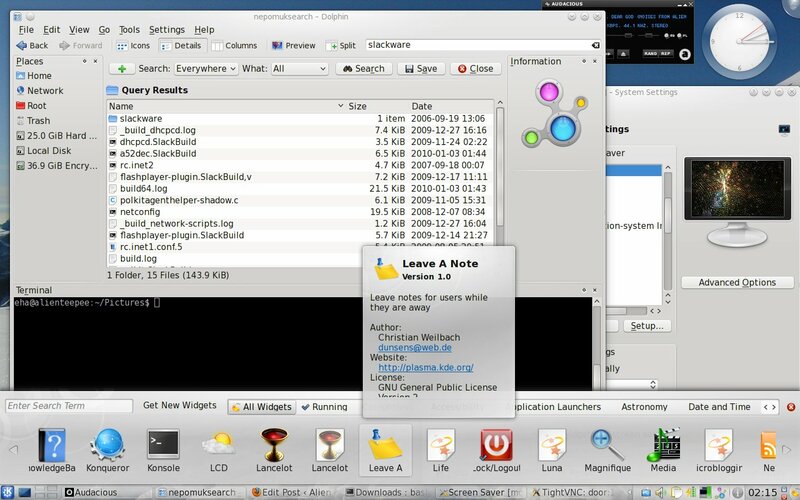 Here is a screenshot of my desktop with Dolphin showing a Nepomuk-powered search result for the word “slackware” in documents that it indexes, as well as Dolphin’s extremely convenient “terminal mode” (just press F4 to open Dolphin’s terminal if you need the speed of the commandline for some file operation). You’ll also notice that adding widgets to your desktop looks quite different now. Posted: 4 January, 2010 in Slackware, Software. Yes, I have been building this for days now, trying to get rid of compilation errors… but the requirements have changed quite a bit, so I am hunting down new versions of the “deps”. The packages have been built successfully and I know of at least one person who is running it (I did not have the time yet to update my laptop).